As soon as the weather changes, all I want is pasta, and I know I’m not alone. This is my go-to when there isn’t very much in the house, because there is always kale (because green smoothies) and garlic. 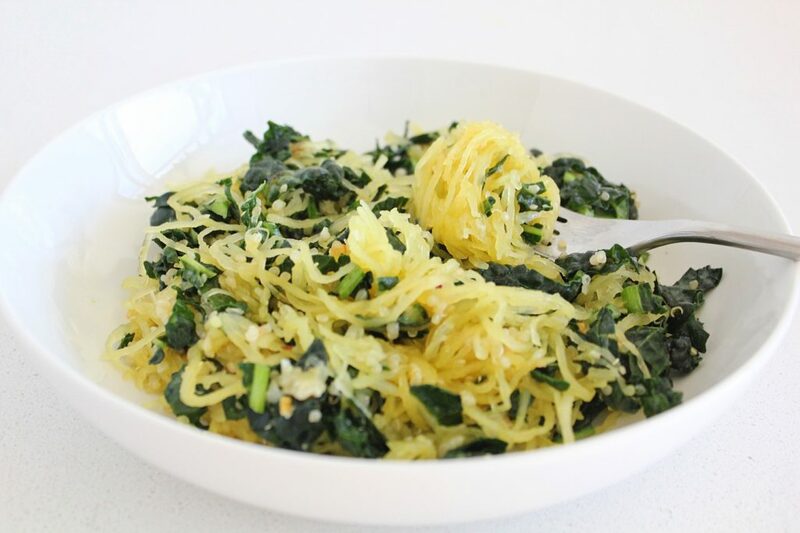 Unlike Zucchini Noodles (which would work in this recipe too), spaghetti squash is carb-y tasting and gives you that cozy fall leaves and crisp air satisfaction that our sweaty summer selves totally forgot about. You also don’t need any special equipment to turn it into noodles, Mother Nature, for some strange but awesome reason, has done the work for us. When I was a little kid and my Mom made squash (which was rare), she would roast it in wedges and give us each a wedge. I didn’t love it but found it tolerable if I spread butter all over it, ate that layer, spread butter over the next layer, ate it, and so on (early gourmand). It wasn’t until much later when I learned to cook that I realized it was probably the salt in the butter that brought the squash to life. I’m telling you this to emphasize the importance of salt (Sea(weed) Salt in our case) in this recipe. Not a lot, but enough to make it taste delicious instead of like a healthy pile of cooked veggies. The olive oil at the end doesn’t hurt either. The Kale is massaged with some salt and a bit of lemon juice, which helps to make it more digestible (for real), and gives it a cooked vibe, which means we don’t have to spend time cooking it down. 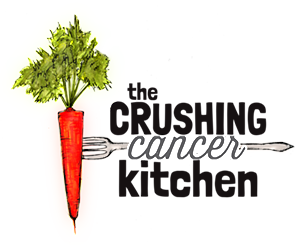 It also means it already tastes good and will lend its seasoning to the rest of the dish. 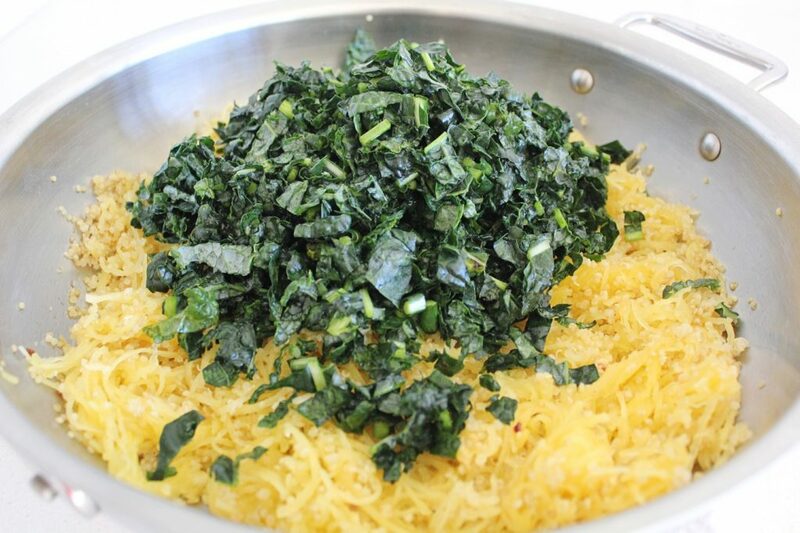 Keep this in mind before you season the rest of the ingredients (taste it once you add the kale). 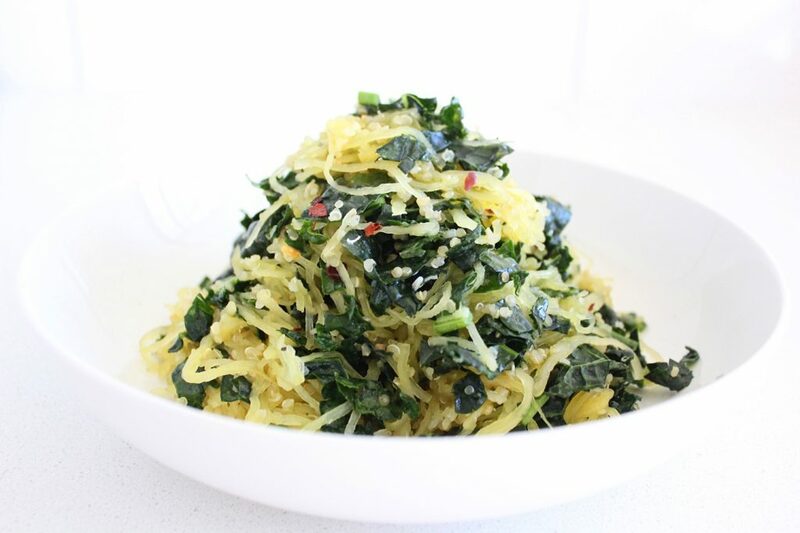 Spaghetti squash is a winter squash and winter squash is warming, which is why this dish feels so appropriate as the weather turns. 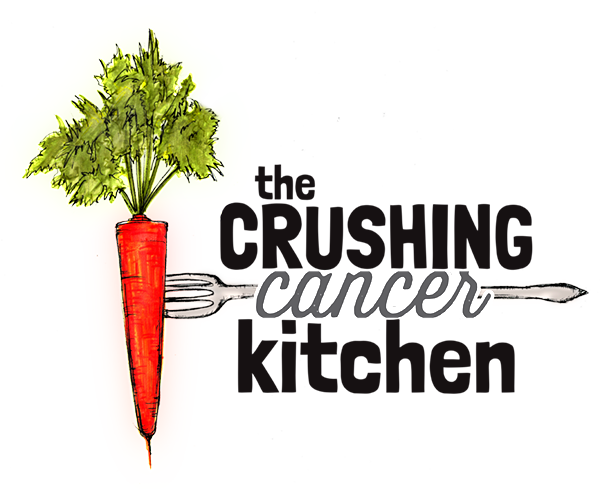 It is also full of beta-carotene (it’s pretty much always orange-y yellow) and is full of potassium (an important mineral that excess sodium can deplete from our system) and magnesium (calming) (just like pasta). 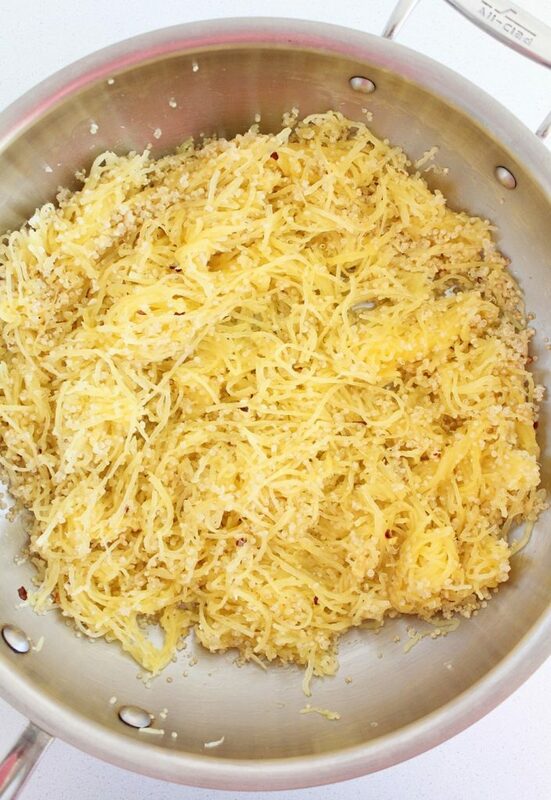 Have you ever cooked with spaghetti squash? It’s totally bizarre, but really easy to cook. The only thing you have to be careful of is not to overcook it. 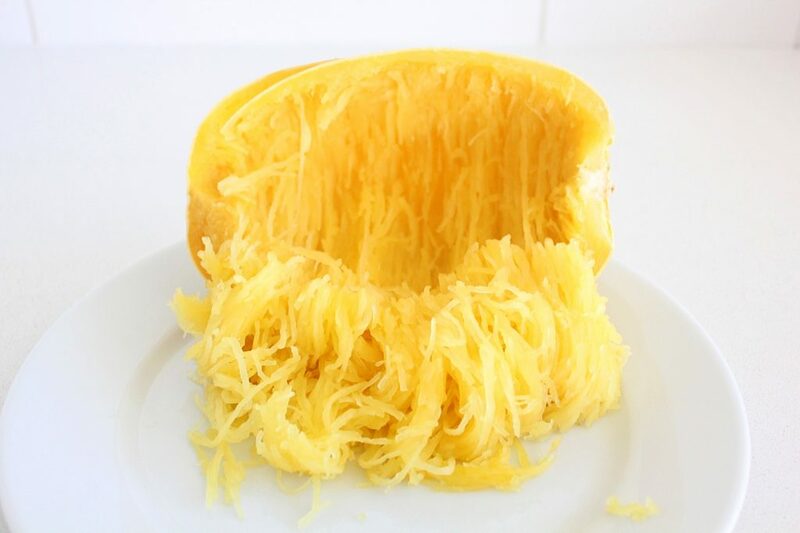 Overcooked spaghetti squash goes from long graceful strands of golden spaghetti to regular mushy squash. 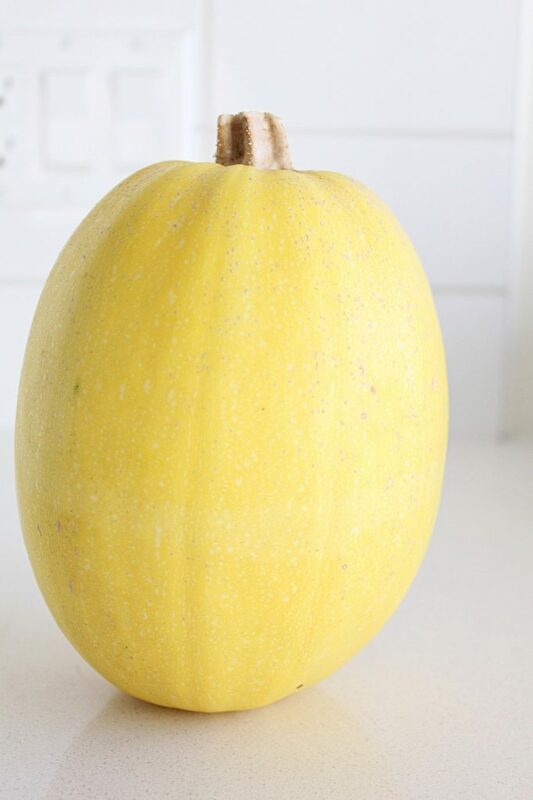 It’s not the end of the world if this happens, it will still be delicious squash (you can even freeze it and add it to soup at a later date) but it can be pretty disappointing when you have a spaghetti-like meal in mind. 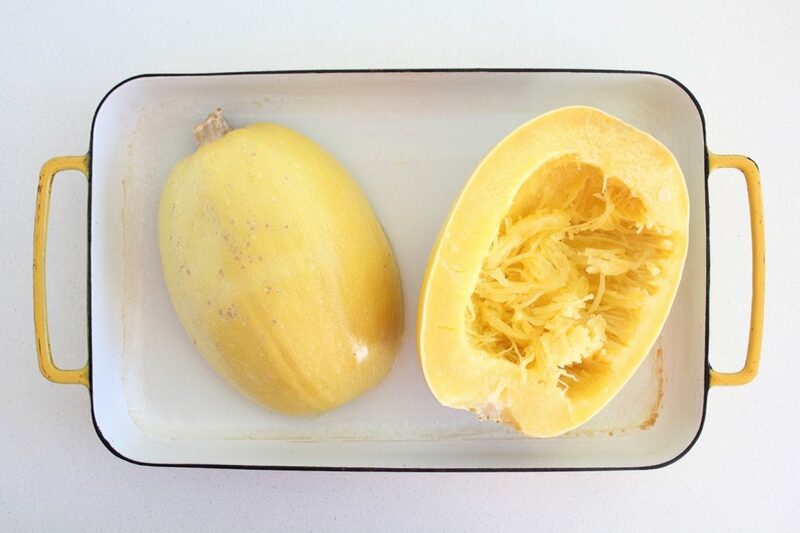 The size of the squash will vary the cooking time, so as much as I would love to tell you 30 minutes would be the perfect amount of time, it will be different for everyone. My advice is to set a timer, and when you check the squash and it’s close, set the timer in closer intervals (check it every five or ten minutes). If you’re like me, relying on your inner alarm clock will lead you to mushville and the realization that you don’t have an inner alarm clock. The seemingly random ingredient in this recipe is the quinoa. I have to say though, it blends well (especially if you soak and rinse it well, to make it less obviously quinoa-y in flavour and then use this method to cook it). It also calmly adds a protein kick that turns this into a balanced meal. 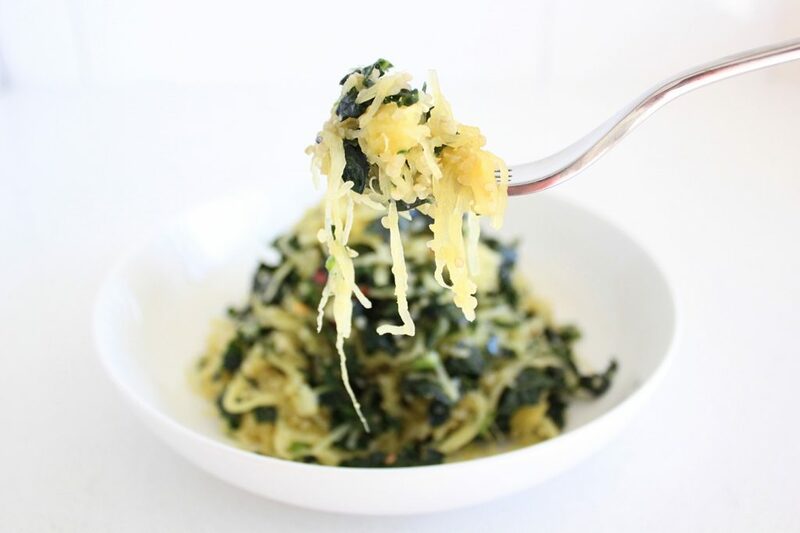 This spaghetti squash pasta gives you enough real pasta feelings that you would probably even enjoy it with a (maybe not kale) salad. Pair it with this Avocado Caesar or this green salad to turn it into a really comforting fall meal (with secretly ALL OF THE VEGETABLES). And if you really love yourself, top it with our plant-based parmesan. 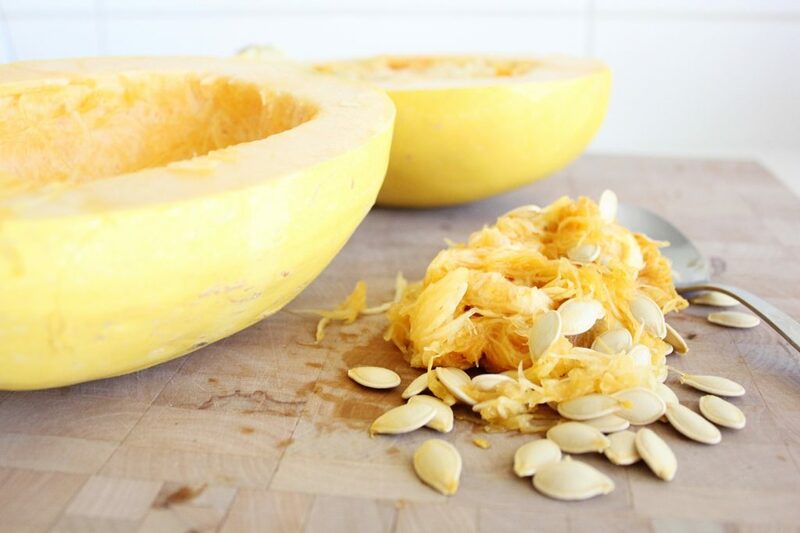 Carefully cut the squash in half, lengthwise and scoop out the seeds and pulp (you can eat these seeds, just like you would pumpkin seeds, just dry them out in the oven). Place cut side down on a baking sheet or oven-proof dish. 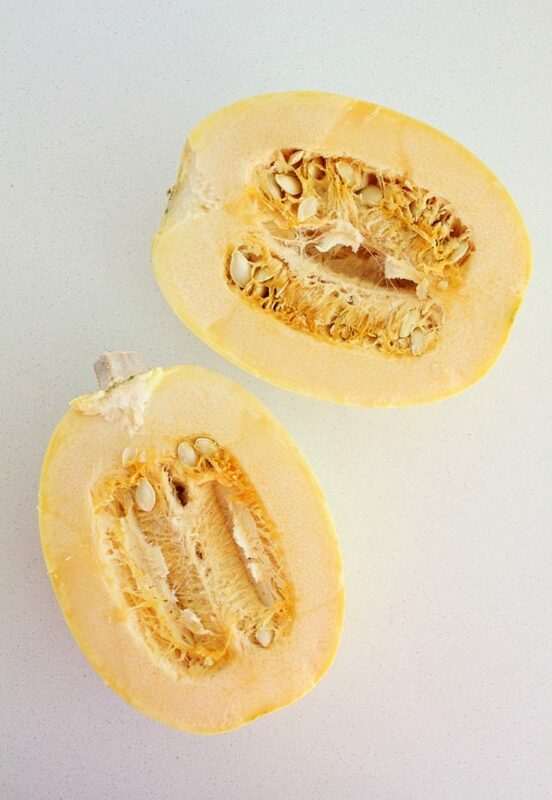 Pour water in until it reaches about 1-2 cm (under and inch) up the sides of the squash. 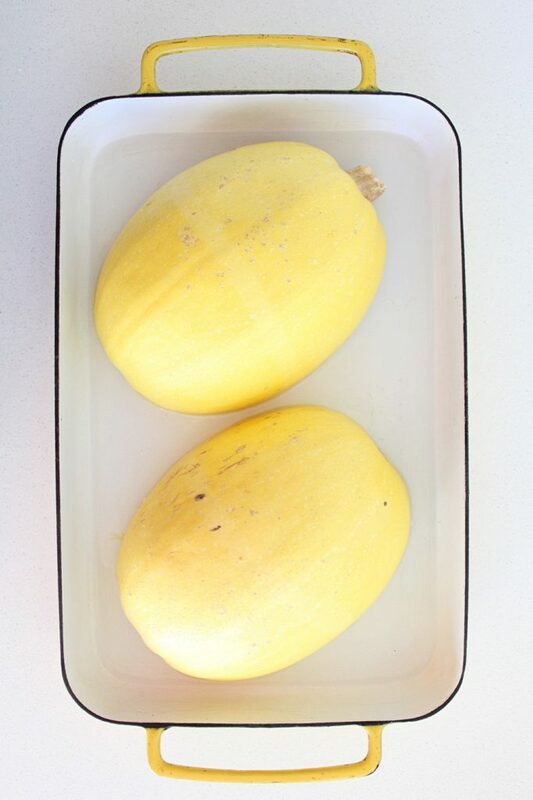 Bake for 25-40 minutes, or until the flesh pulls away from the sides of the squash into spaghetti strands (using tings, carefully flip the halves over to check this). Be careful not to overcook it, use a timer and try to underestimate how long it will take. It is better to under-cook it a little bit than overcook it, because you can always finish cooking it in the pasta pan. Once removed from the shells, spread the spaghetti strands out on a flat surface so that they don't overcook from residual heat, until you're ready to throw them in with the rest of the ingredients. You can even make these a day or two in advance. Put all of the ingredients in a large bowl and literally massage it and squish it up with your hands until it resembles cooked kale. 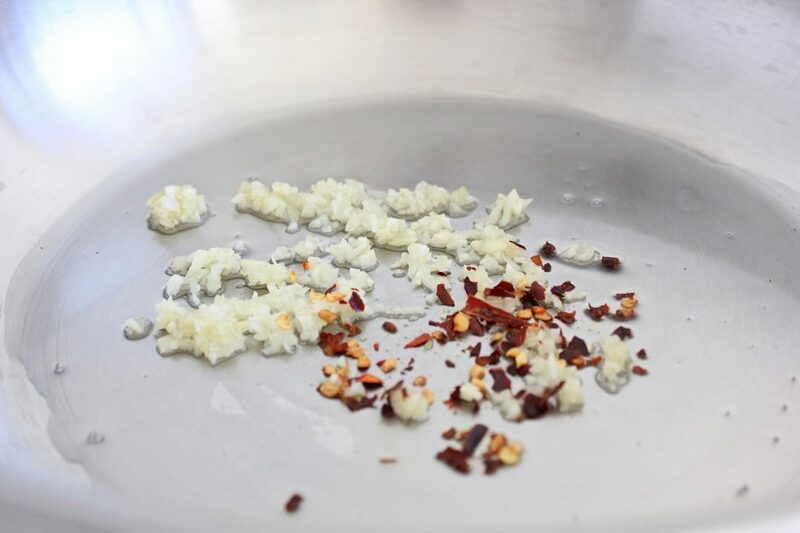 In a large pan, sauté the garlic and chili flakes until the garlic softens and starts to smell good (use a low heat, you don't want to brown it). Add the cooked quinoa and squash and toss it all together to disperse the flavours and heat it all through. 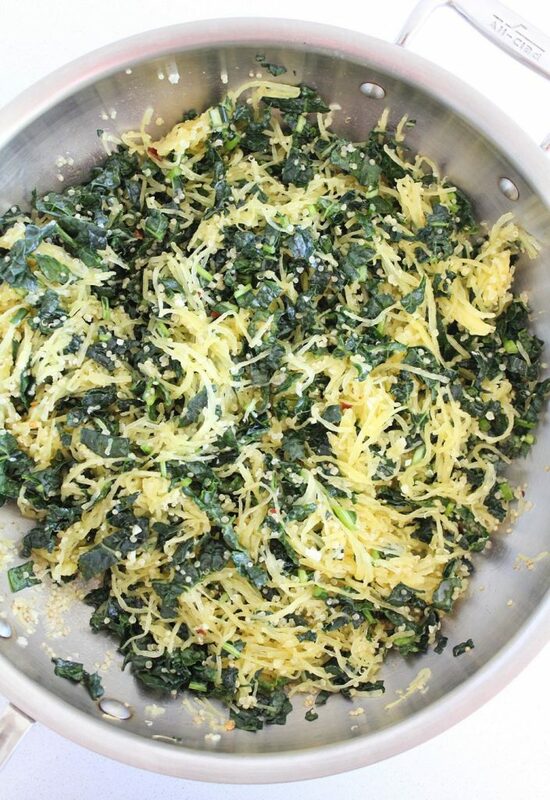 Turn off the heat and add the kale and the olive oil, gently stirring to mix it through. Taste it for seasoning, it may (probably will) need some more sea(weed) salt. Top with our plant-based parmesan cheese.